Well, well, well. Look what just arrived in the mail. Delivered directly to my doorstep. 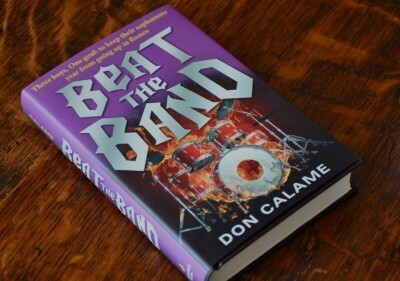 My very first hardcover copy of BEAT THE BAND. It looks super cool, if I do say so myself. The designers at Candlewick really out did themselves with this one. I am really pleased. Not to mention, the story inside is pretty good as well. Not that I’m biased or anything. But dollar for dollar I seriously doubt you will find more laughs for your hard earned cash than inside the pages of this super fun book. I’m just saying. Now, onto other important things. Regular readers of this blog (and you know who you are) will remember that I have been trying to lose a few pounds so that I can regain my fighting weight of about 165. I’d eked up to around 182 which, according to the charts, is not a healthy place for me to be. I have writing and pastries to thank for transforming my fancy six pack into a cheap three pack and then into a single bargain basement forty. And since I need to fit into my only suit to attend my stepson’s wedding (without having to “let it out”) and since I also don’t want to move into that gravesite I purchased any time soon, it was imperative I slim down. Well, Regular Readers, you’ll be happy to know that with the help of my iPad (yes, I keep plugging that damn thing) and a fantastic app called MyNetDiary, along with many visits to the gym and many more bowls of muesli for breakfast, I have shed between 9 and 11 pounds—depending on the scale I am using, where said scale is placed on the uneven bathroom floor, the amount of humidity in the air, what I snuck-ate for dessert the night before, and various other factors I either do or don’t have control over. Now, I just need to lose another 8 or 9 pounds and I’ll be golden. Wish me luck. I’m certain there is much more to tell you—like the fact that I FINALLY finished THE PASSAGE by Justin Cronin and thought it was great if not a bit on the long side. And that I’ve just started THE HUNGER GAMES which everyone else in the world has read but I never got around to and am enjoying that as well. As I look at the clock I see that the day is escaping me and so I will sign off. One of these days I am going to write a blog completely dedicated to the many wonderful apps I’ve been discovering on the iPad and how Apple is ushering us into the future that our parents always promised us. But until that time, I must get back to Sean and his adventures in Book Three of the Swim Trilogy (formerly known as The Swim the Fly Trilogy, to be known in the future as TSTF Trilogy).